AACHEN, GERMANY: Aachen is one of the great small European cities that definitely deserves more visitors. The good part of it is that, though the city has the site first to be recognized as a UNESCO World Heritage in Germany, you don’t have to be lost in a crowd of hundreds of people to get there. I must say this place is more intimate and welcoming than other big German cities. Aachen was the place of coronation of the Kings of Germany back in old days. You can still find medieval architecture by your side when walking around in the old part of it. The city was heavily damaged during World War II (like medieval Church St. Foillan) and this was the first German city to be captured by the Allies. TIME OF TRAVELLING: My parents were visiting us from the USA in end of May, 2012. They wanted to get some TASTE of Germany during their stay. Aachen being only an hour and half drive from Tervuren, Belgium, it was a perfect place to make a quick day trip. We enjoyed the hot sun after the long winter we had this year in Europe. Kids were also happy to run around in the cobbled streets of Aachen in their shorts and sleeveless t-shirts after a long time. 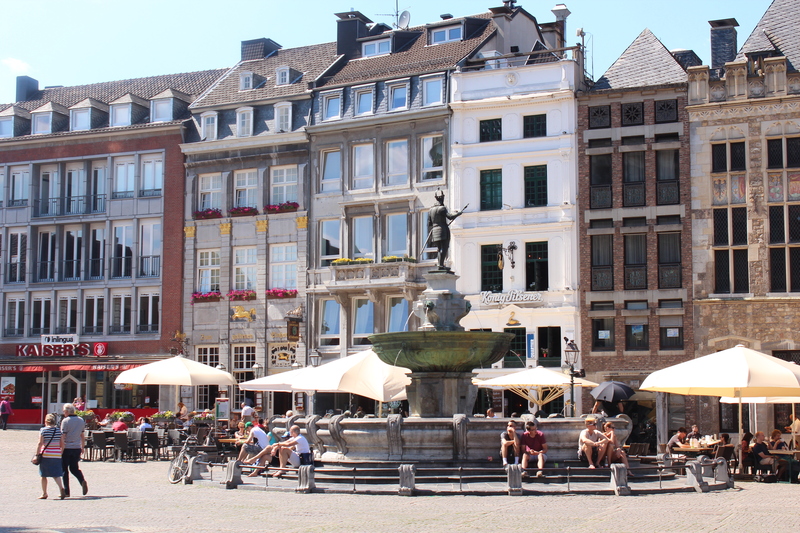 WHAT TO BUY AND EAT IN AACHEN: We went to Aachen on a Monday, which was a government holiday (White Monday in Europe or Memorial Day in the USA) here in Europe. We found every store closed, except for the cafes and some bakeries. We couldn’t buy any souvenirs, but treated ourselves with some German-style big dishes followed some pastries afterwards from local bakery shops. I can’t remember the name of the restaurant, but we had our lunch right by Aachen Cathedral, which not only had great food but also had awesome customer service. 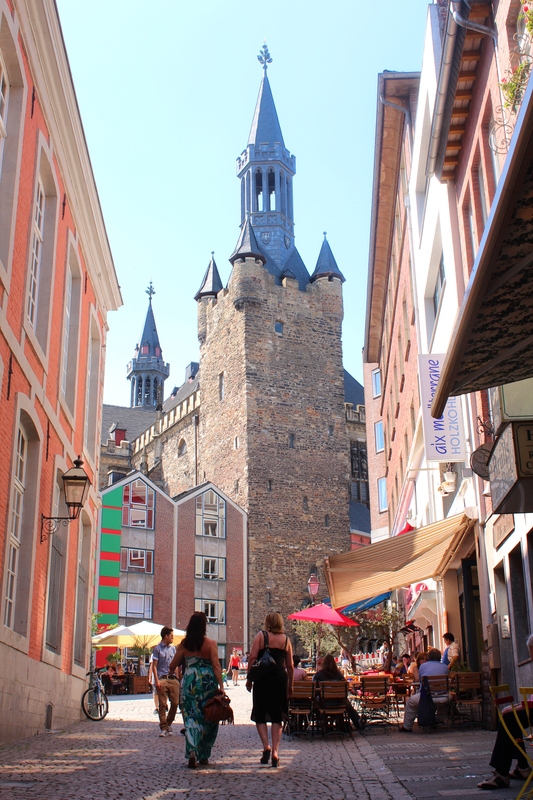 PLACES WE HAVE VISITED: We mostly stayed in the old town of Aachen for the whole day. 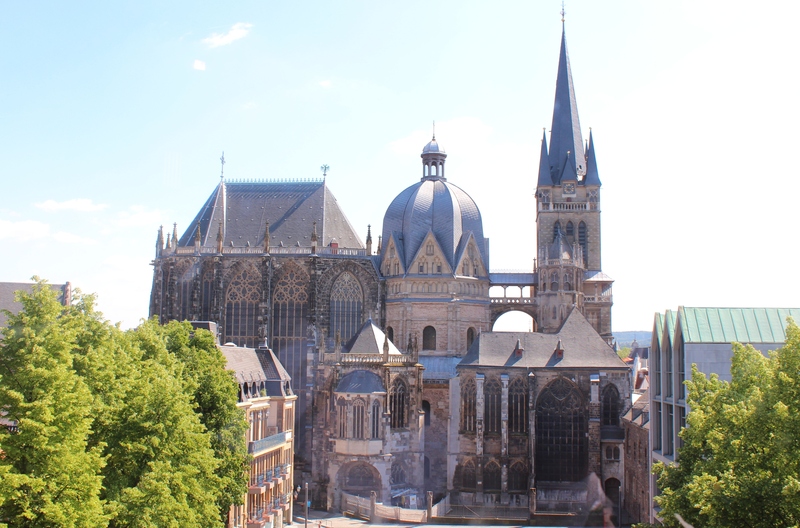 1) AACHEN CATHEDRAL: This is the OLDEST cathedral (dates back around 792 A.D.) in northern Europe, and beautifully situated in the heart of old town of Aachen. Due to its great significance for the history of both art and architecture, Aachen Cathedral was the FIRST German historical monument admitted to the UNESCO World Heritage list of cultural values in 1978. 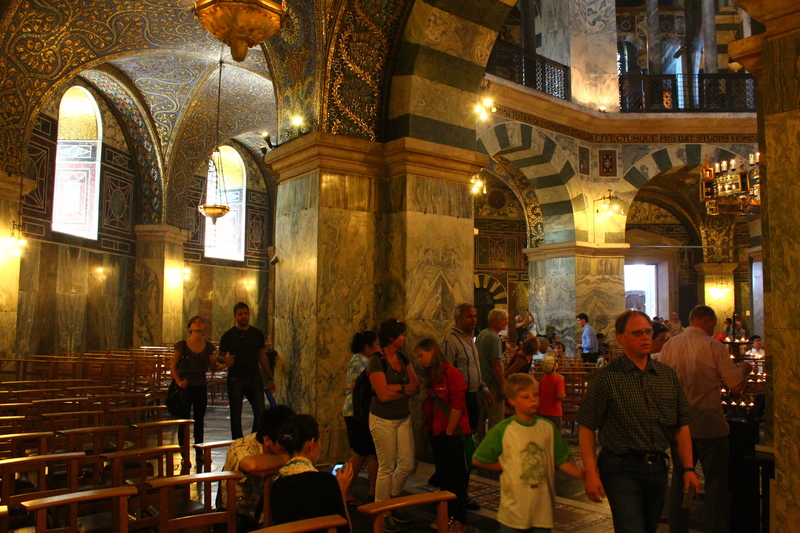 It’s gorgeous golden ceiling, marble wall, beautiful altar, mosaic floor will take you back in time of the Early Middle Ages. The cathedral is open from 10-6 everyday. There is no charge to enter the site but you have to PAY an euro to TAKE photographs inside the cathedral. That one euro is worth every bit of it, believe me. Despite of its size, this is has to be the number one place to visit in Aachen. 2) ST. FOILLAN CHURCH: This is an old church standing beside Aachen Cathedral in the pedestrian zone from the year of 1180. The church was almost completely DESTROYED in air raids during WWII in 1944. 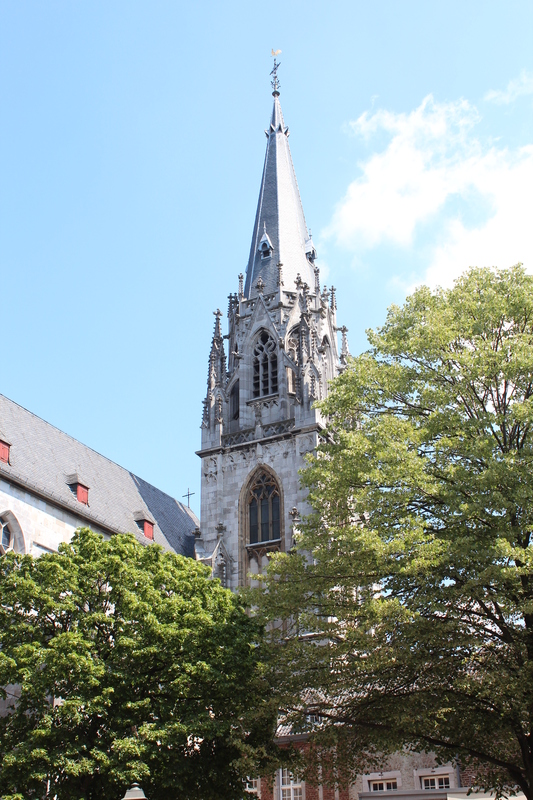 Anyone can locate this church by its tall neo-Gothic spire which boldly dominates Aachen’s sky. 3) TOWN HALL/RATHAUS: In the place of today’s town hall there once stood the Palace of King Charlemagne of Aachen in the 8th century. 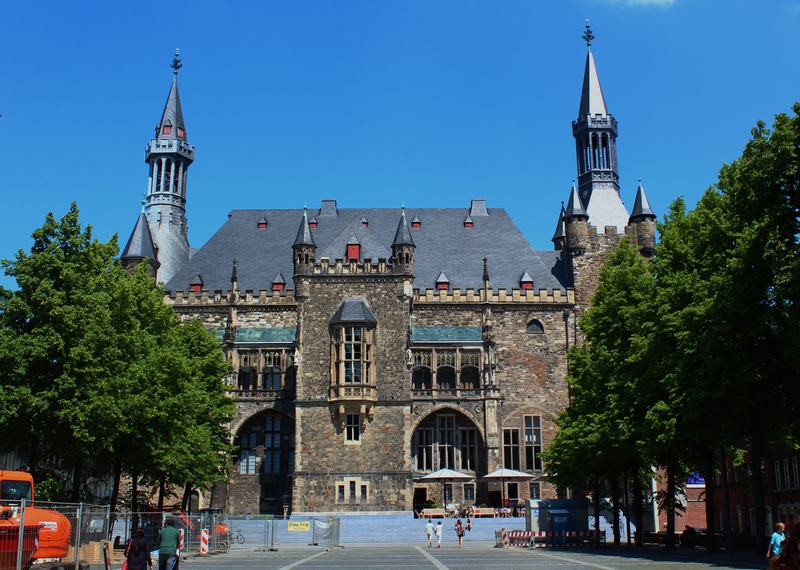 King Charlemagne started building his favorite palace in Aachen from 789 on, and after his coronation in Rome in 800 it became his permanent seat of residence. The present town hall was built in the 14th century on the foundations of the former palace, and within some of its surviving outer walls. Later, this Rathaus went through numerous renovations and restorations transforming from Gothic Town Hall to a Baroque style, and finally to a neo-Gothic Town Hall in 1901. It’s 20 meters tower is preserved in its original Carolingian state. The building suffered heavy damage from bomb raids during WWII in 1944. 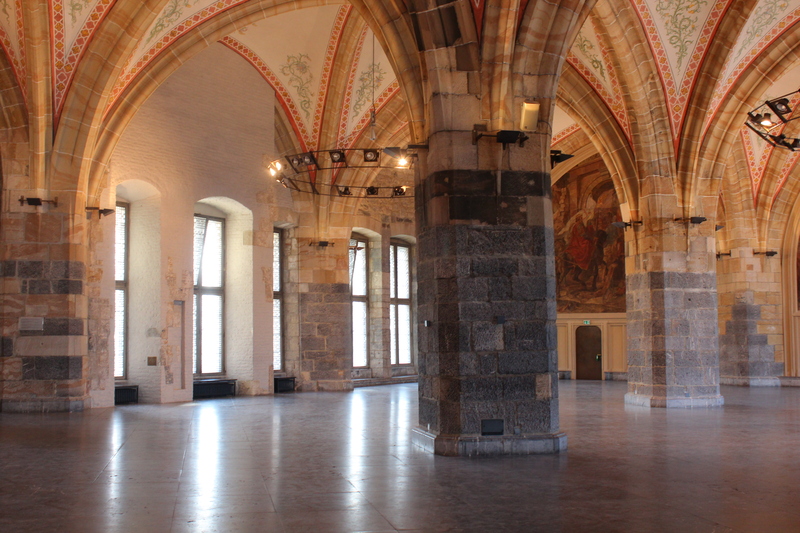 This beautiful and elegant town hall is open to the public everyday from 10-6. It’s only 10 euros for the whole family to go inside and an extra 1.50 euros for audio tour guide. Tourists can visit the beautifully decorated rooms with high ceilings, Assembly Hall of the City Council, marvelous looking Coronation Hall, and the Ark Staircase. 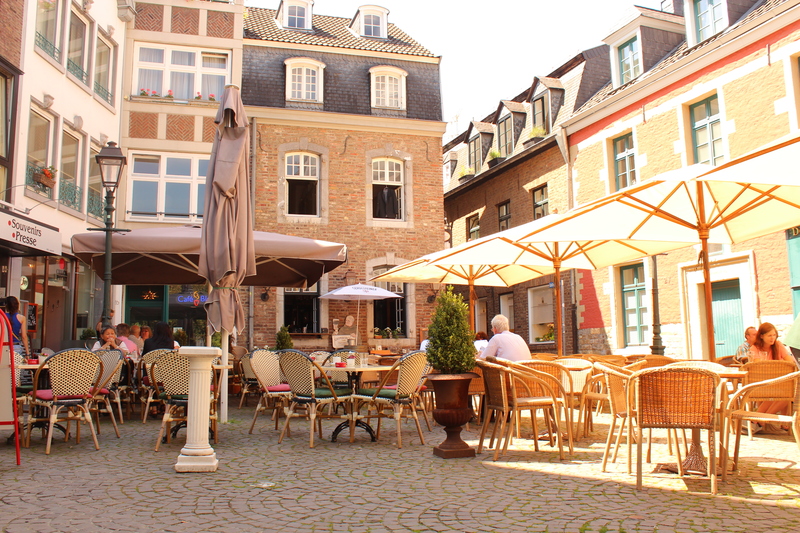 4) OLD TOWN AACHEN: The old part of this city gives you a medieval taste of its past. The lively squares, small cafes, and old buildings offer a relaxing yet charming atmosphere for the locals as well as the visitors. Aachen Cathedral, St. Foillan Church, Rathaus (Town Hall) are all located here within walking distance. 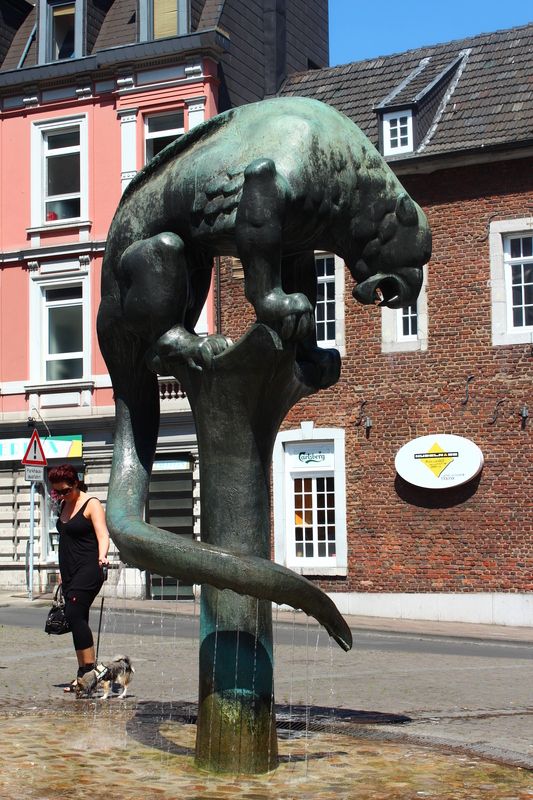 Don’t forget to enjoy the artistic statues and sculptures while roaming around this old town. 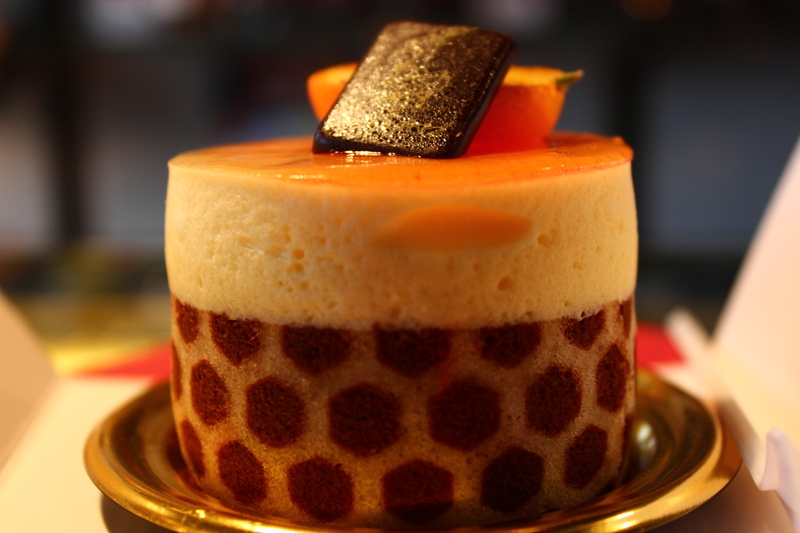 The treat looks delicious(!). Where is the picture with the green-ish water taken? I like places like this…small, untouristy, and charming.